Here is an example of what I call the “Posture Group”, which teaches children how to make basic good sound and helps to develop their technique. From there on we lead on to group pieces, solos and duets with parents or with other children in the group. This video shows children and mothers having fun together at all levels, playing, walking about and ending up with playing God Save the Queen for the end of the Jubilee 2012 Concert. Ruben plays Gavotte by Lully, a piece from the end of Suzuki book 2. This video shows the experience a child gets from performing a piece even if he is not quite ready for a concert performance. Rhys, who has just mastered Minuet by Boccherini from Suzuki book 3, was allowed to play it with accompaniment at the Christmas 2011 Play Together. Pierce progression from age 3 to age 5. Pierce is playing pieces from Suzuki book 1. 3 years old Sophia plays twinkle first variation “Piccadilly Circus” with fingers at Easter Play Together 2012. Pierce plays Musette by J.S. Bach, a piece from Suzuki Book 2, during the Summer 2012 Concert. Ruben is playing Minuet in G by Ludwig van Beethoven, a piece from Suzuki Book 2, at the Summer 2012 Concert. Videl Bar Kar, who trained with Lya Silver from the age of 5, managed to get in to Westminster School with his music scholarship and then he was given a bursary. While he was studying at Westminster School he continued with the Suzuki method and repertoire and he was chosen to play solo with the orchestra before moving on to university. In this video, he plays Romance by E. Elgar. Whilst he was at university, Videl still enjoyed to take part at Holland Park Suzuki Group concerts and played solo pieces, duets and quartets with the other pupils. In this video, he plays the first two movements of Concerto n.1 by J.S. Bach, a piece which is included in Suzuki Book 7. Videl plays the Adagio movement of the Violin Sonata n. 5 also known as “Spring Sonata”, a piece by Ludwig van Beethoven which is not in the Suzuki repertoire. Videl plays Salut d’Amour, a piece by Edward Elgar which is not in the Suzuki repertoire. Maud and Otto play in a duet Gavotte by P. Martini, a piece from Suzuki book 3. Maud trained with Lya Silver since she was 3 years old. She studied at Christ’s Hospital School and at the age of 16 she became the leader of the School’s Chamber Orchestra. Iona and Videl are performing Chorus from Judas Maccabaeus by Handel from Suzuki book 2. More advanced pupils are playing pieces that are familiar and played by the young children. Maud, Stephanie, Otto and Videl are performing in a double duet Bourree by Handel from Suzuki Book 2. More advanced pupils are playing with the younger ones to stimulate them and bring them on. Vas and her two children Ruben and Hazel play Hunters’ Chorus by C.M. von Weber, a piece from Suzuki Book 2. Victoria and her daughter Sophia, age 4, play Song of the Wind duet in Summer 2013 concert. Ann Marie and her son Patrick started to train at Holland Park Suzuki Group with Lya Silver since 2008. This video shows their progression from beginning stages to book 2. Ann Marie, mother of two boys, plays Gavotte by Gossec, the last piece of Suzuki Book 1 also a graduation piece for Suzuki level 1, in Summer concert 2011. 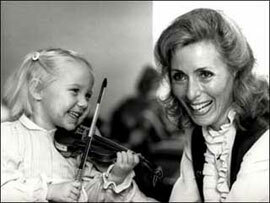 She started learning the violin, which is her first and only instrument, together with her first son. This piece takes time to master but for performing experience it is allowed to be played with accompaniment in a Play Together in order to eventually prepare it for a concert performance.